Dimitar Bechev’s new book ‘Rival Power: Russia in Southeast Europe’, (Yale University Press, 2017). Dimitar Bechev is currently a research fellow at the University of North Carolina at Chapel Hill. He has extensive experience in the world of policy and is affiliated with the Atlantic Council think-tank in Washington, D.C. In 2015, Dimitar Bechev became the founding director of the European Policy Institute, a small but dynamic outfit based in Sofia, Bulgaria. His area of expertise cover EU external relations, especially enlargement and neighbourhood policy, the politics of Turkey and the Balkans, and Russian foreign policy. Prior to the University of North Carolina, Bechev held fellowships at Harvard’s Center for European Studies and the London School of Economics. Having authored or edited several books and articles in academic journals, he also publishes on current affairs in outlets such as the American Interest, Al Jazeera Online, Foreign Policy, openDemocracy and others. In 2010-14, he headed the Sofia Office of the European Council on Foreign Relations (ECFR). Prior to that Dimitar Bechev taught International Relations at Oxford where he obtained his D.Phil. in 2005. 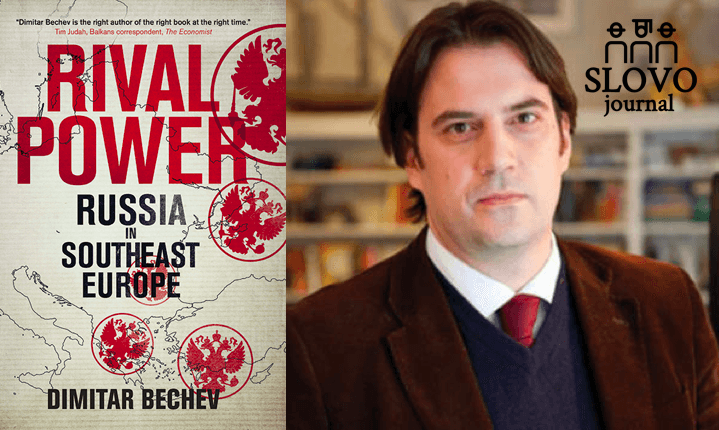 Dimitar Bechev is in conversation with the Executive Editor of SLOVO Journal, Borimir Totev, about his latest book ‘Rival Power: Russia in Southeast Europe’ published by Yale University Press. Why did you initially decided to enter academia within this particular field? Was there a turning point or a moment of clarity? I have always been fascinated with international politics and knew I would pursue a graduate degree. I arrived to Oxford in 2000, at a moment the EU, as well as Europe as a whole were undergoing dramatic changes. Southeast Europe was at the forefront as former Yugoslavia, following a decade of wars, and Turkey embarked on the path of membership, and Bulgaria and Romania entered accession negotiations with the EU. Such momentous events provided the inspiration for my D.Phil thesis and ultimately the book I published in 2011, Constructing South East Europe (Palgrave), which explores the international relations of the region. Though there are IR scholars who stay in the academic ivory tower, that has not been my case. Where do you position of social sciences within wider society? I have not pursued a typical academic career but have been moving back and forth between universities and think-tanks, which does have its disadvantages but also helps one get a better perspective on world affairs. Academic training provides the means to think a rigorous manner. There are far too many pundits and current affairs analysts who juggle terms and conceptual shortcuts uncritically. Or who lack historical depth to see through the latest hype. Equally, academic researchers are better off if they keep up-to-date with global political events which, admittedly, develop at breakneck speed and think more clearly about what their particular project means for those outside the university circuit. Navel-gazing is not what social science should be about. How does ‘Rival Power’, as a Russia focused project, differ to your previous book publications? Rival Power is an attempt to bridge the divide between scholarship and current affairs writing. It looks at Russia’s growing footprint in Southeast Europe – a region comprising the post-communist Balkans, Greece, Cyprus, and even Turkey, heir to the Ottoman Empire, which once dominated the area. I argue that Russia has no strategic ambitions nor is it driven by the rich historical legacies which link it to the Balkans. It simply exploits opportunities to poke a finger into the eye of the West, at a moment when relations with the US and EU are at their lowest point thanks to the annexation of Crimea and the war in eastern Ukraine. Yet, contrary to other authors, I put a great deal on emphasis on local players too (governments, individual leaders, business lobbies, political parties etc.). Rather than being mere pawns or proxies of Moscow, they often leverage their connection to the Russians to advance their own, often parochial interests. It is a two-way street. And more than once, Russia has suffered setbacks – a point that many writing about the standoff with the West and Putin’s talents as a foreign policy chess master often fail to appreciate. Readers can also learn much about the twists and turns in the ambiguous relationship between Russia and Turkey, a marriage of convenience, as I call it. My hope is to draw in both readers following Southeast Europe, who may or may not know much about Russia beyond the usual stereotypes, and those interested in the broader subject of Russian foreign policy and Moscow’s influence beyond the confines of the former Soviet Union. The book is available on Amazon or from Yale University Press’ website. Excerpts will be published by The American Interest.